Reward-based training, good communication and structure is useful as a basis for fixing many different types of behavior problems. There are many things that can make our dogs difficult to live with and problem behaviors can easily snowball. Issues such as aggression towards other dogs, anxiety, and unruly behavior can often be assisted by structured and consistent training. There are various programs out there, including Nothing in Life is Free, Learn to Earn and No Free Lunch. They are all pretty similar and the emphasis is on encouraging your dog to look to you for direction. While not all behavior problems will be instantly fixed by good training, providing consistent and clear patterns in your dog’s world can be extremely reassuring to them. Anxious dogs, fearful dogs, those that seem to have attention deficit disorder or hyperactivity, all types of personalities can benefit from this technique. Good communication between pet and owner, finding ways to motivate your dog to do specific tasks for rewards switches the relationship very subtly into one where good behavior gets rewards. Unfortunately for many pet owners the dog that they have ended up with, is not necessarily what they imagined. Without structure and guidance, our dogs will not understand what we want from them and their learning becomes a little random. Dogs are intelligent creatures and whether we give them structured training or not, they are learning cause and effect all the time. For example I jump up on mum when she gets home and she looks at me and touches me, so I’ll keep on doing it. In many cases dogs develop attention-seeking behaviors, bark, pull on walks, jump up on everyone and may even be aggressive towards other people or animals. If you’ve ever wistfully gazed upon those ‘perfect’ dogs at the park and wished your dog was a little better behaved, this program can help. Rewards – Won’t That Make My Dog Fat? The most consistent way to reward good behavior is to use food rewards. Some dogs are play motivated too, but it can be hard to deliver play quickly and on cue. Dog’s don’t find praise that rewarding, sure they might wag their tail and look happy when you say their name or say ‘good boy’ in a friendly tone of voice, but it won’t drive them to perform and encourage them to learn new skills like a treat will. If you have a very food motivated dog, you are half way there. You don’t need to use high calorie treats, tiny pieces of liver treat, chopped up carrot (put it in the bag with the liver treats, so it’s a bit ‘seasoned’), small pieces of BBQ chicken, or if your dog is overweight, just use regular dry food throughout the day. Much more exciting than eating out of a bowl anyway! For more healthy treat ideas, visit here. If your dog isn’t that excited by food, you may need to start rationing a little and rather than just filling up a food bowl and walking away. Use all food as a training aid. Don’t I Need to Dominate my Dog and be a Pack Leader? The prevailing wisdom around 10 years ago was that if you were a strong pack leader, your dog would obey you without question. This type of training was based on physically asserting your dominance often in some pretty distressing ways, particularly for anxious dogs. Even now that behavior theory has moved on, there are still lots of trainers using punishment and outdated techniques that are harmful to the pet-owner bond. We commonly get people guiltily saying that their dog sleeps on their bed as though that is the cause of all problems. There is no problem with your dog sleeping on the bed, going through doorways before you or eating before you. Dogs don’t see us as other dogs and the Dominance Myth has been thoroughly discredited. Keep it simple and just reward the good stuff and ignore the bad. Shouldn’t I Punish my Dog? Just as treating your dog like a wolf is confusing, punishment is also confusing, so put down that rattle box, avoid the water spray and give up on shouting at your dog. None of these things correct behavior, they just lead to confusion. Your dog usually has no idea what you want, so that ‘guilty’ look is just fear. Guilt is actually a pretty complex human emotion, which luckily our doggy companions don’t suffer from. Lucky them! Punishment is so often used inappropriately and often sets up a situation where your dog fears what you might do. Keep things positive and work on reinforcing the good. This program is known by a few names, but essentially the idea is that if your dog performs a set behavior, a reward is given. Spreading these rewards out throughout the day and through different situations means your dog will start to look to you for direction and for ways to please you. Sometimes, the only way our pets get our attention is by coming to you for reassurance or doing something ‘naughty’. We often reinforce annoying attention-seeking behaviors like jumping up, whining for attention, barking and chewing. If we only pay children attention when they throw a tantrum or hit their sibling, rather than when they are playing quietly, they are much more likely to act up. Somehow it seems much easier when we think about kids, rather than dogs, but learning theory is exactly the same. A two-year-old is at a similar intellectual level to a dog, but is probably a bit less keen on liver treats. Most dogs know how to sit, so this can be a great starting position. Allocate a portion of treats (or regular dry food) to be distributed throughout your time with your dog. Take this zip-lock bag with you everywhere, on walks, in the house, outside, absolutely everywhere. If you prefer not to smell like a liver treat, put treats strategically throughout the house, so you can access them easily. Then start asking your dog to sit for a treat randomly throughout the day. You can also ask them to sit before, a walk, patting and any form of attention. If your dog knows any other tricks, this is your chance to work on them. And feel free to train some more advanced skills too, just for fun! While this is happening, ignore any attention-seeking or naughty behavior. If your dog tends to come to you and put his nose into your hand for a pat ignore it and call your dog over randomly for pats when you decide. We don’t want you to withdraw your affection, but just give it on your terms. For those Velcro dogs that always seem to need reassurance, follow you everywhere and need your presence, it can actually increase their happiness levels. Often a Velcro dog wants attention at a time you can’t give it, like when you’re cooking dinner. This can mean you push them away sometimes, but happily cuddle them at other times. This inconsistency can make anxious dogs worse and they increase their attention seeking behavior because the rely on it to feel secure. But it’s never enough, is it? They will never gain confidence if they rely upon you reassuring them. Increasing predictability and teaching your dog how to get your attention for performing a behavior is the key to increasing their confidence in their own abilities. For those hyperactive dogs that seem unable to concentrate, wait until they calm down. Exercise them as much as possible and work on puzzles to keep them mentally stimulated. For your program, as soon as you get a second of calm, redirect with a sit and reward. For dogs that leap around and can’t seem to concentrate for a second, work on ignoring the leaping and jumping to start with. As soon as your dog jumps, just turn your back and avoid eye contact. Don’t say a thing until your dog stops for a second and all 4 feet are on the ground. Then give eye contact and ask for a sit. If your hyper dog can’t concentrate enough to sit and immediately jumps up again, first work on just rewarding any calm offered. Even if that calm is just 1 second of all 4 feet on the ground. There is more information here. It will take time for a negative behavior to stop, so be patient. Your dog has probably been behaving a certain way for a very long time, so don’t expect him to stop immediately. In fact, research shows that if a behavior was previously rewarded, the tendency is to try even harder to get a response. If you push a button for the lift to arrive, but the lift doesn’t arrive, you are definitely going to push that button harder and even more times before you give up and take the stairs. Just be consistent. Don’t confuse things by even looking at your dog when he acts up! So you’ve been rewarding your dog for sitting throughout the day and being consistent in your interactions. Focus on asking your dog to sit for everything and make sure even when you go to the park he is still focused on you. For many dogs, even this change will fix a problem behavior. If not, you might need some more focused strategies. 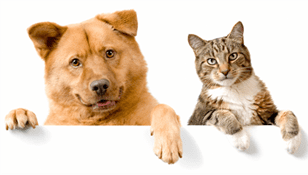 The post No Free Lunches – Simple Tips for Good Behavior appeared first on Love That Pet.